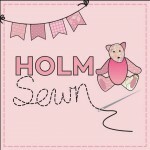 Holme Sewn is run my local mum Nikki. She makes all sorts of custom made, hand sewn items including nursery sets, clothes, bunting, cushions, handbags, cosytoes/pram liners, quilts and toys (all conforming to UK safety standards). Everything can be made to order in your choice of fabric and many items can be personalised. For more info and to order please visit her facebook page.